The Urban Traffic Management Board No. 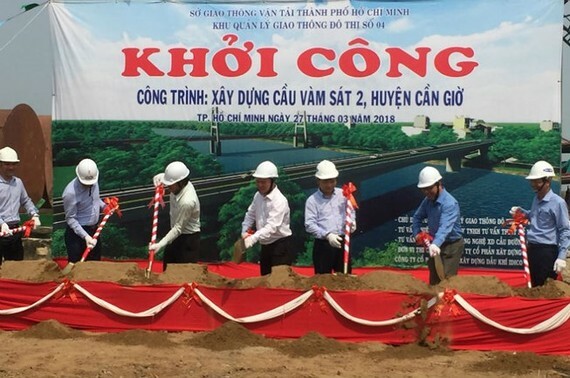 4 under the HCMC Department of Transport yesterday started the construction of Vam Sat No.2 Bridge spanning Vam Sat River in Ly Nhon commune of outlying Can Gio district, HCMC. The bridge project includes the 432.7-meter bridge, roads to the bridge and light system and other subsidiary construction. The bridge has width of 10 meter, and the path to the bridge is 647 meter long. 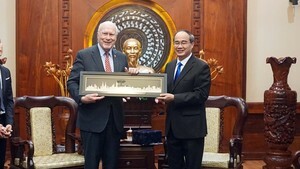 Total spending for the construction is VND342 billion ($14,985,171) taken from Ho Chi Minh City’s state budget. It is planned to build the bridge in 580 days; however, the management board promised to beef up speed. Before, in 2005, the Vam Sat No.1 was built and open to the traffic yet it has low loading capacity and it is just 4 meter wide with one lane only; accordingly, it can’t satisfy travelling demand of residents in Ly Nhon commune only.